Why choose a garden irrigation system? As our weather becomes ever more unpredictable keeping your lawn and plants well watered could become increasingly difficult. Even if predictions of ‘Barbeque summers’ have proved to be well wide of the mark recently; a prolonged dry spell can leave lawns parched and plants dehydrated. Finding the time to water a garden can also prove difficult when faced with work and life commitments, an irrigation system could be the solution. What are the benefits compared to using a hose? Irrigation systems for gardens bring a number of benefits such as convenience and greater efficiency by ensuring water is distributed only where it is needed – direct to the plants. 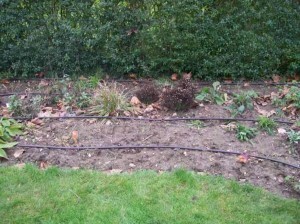 The use of a hose can be detrimental when sprayed in-discriminatory over beds and lawns leading to scorching of plants and grass on hot summer days. Additionally there is a lot more wastage as often water is distributed where it is not required, putting a strain on supplies and increasing the likelihood of a ‘dreaded’ hosepipe ban! We can offer a service providing a variety of watering solutions for your garden. From drip irrigation systems that water the base of plants allowing easy absorption by the roots, to sprinkler systems that can be set to operate at various times during the day. 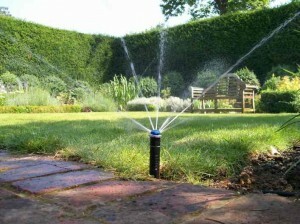 During the initial free consultation we can discuss your needs, producing the best irrigation solution for your garden. A plan is then produced outlining the installation of the system with a team of experts carrying out the work. Irrigation need not be confined to beds and lawns either, systems can be adapted to cater for hanging baskets and pots, both of which can be particularly vulnerable to drying out during long spells without rain. This will vary greatly depending on the size and complexity of the system required, a site visit will be necessary to determine costs. It is part of the free initial consultation and there is no obligation on the part of the customer should they choose not to proceed. For those most concerned about water conservation; rainwater harvesting can be incorporated into any of our irrigation solutions allowing the customer to collect water during the wet winter months for use later in the year. 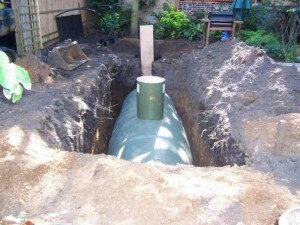 Storage tanks come in a variety of shapes and sizes to suit your requirements. 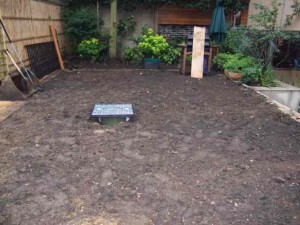 A pump inside the unit can then be utilised to distribute the water around your garden. The area around the tank in-filled leaving only the access cover visible. It goes without saying that with the eventual introduction of water metering for everyone a rain-water harvesting system not only makes good environmental sense but in the long term economic sense too. To find out more about irrigation for your garden or rainwater harvesting please fill out our online enquiry form or call 01442 265297.